“Not a cosy play, this” – Ava Wong Davies writes on Pinter’s study of adultery, staged with icy persuasiveness by Jamie Lloyd. 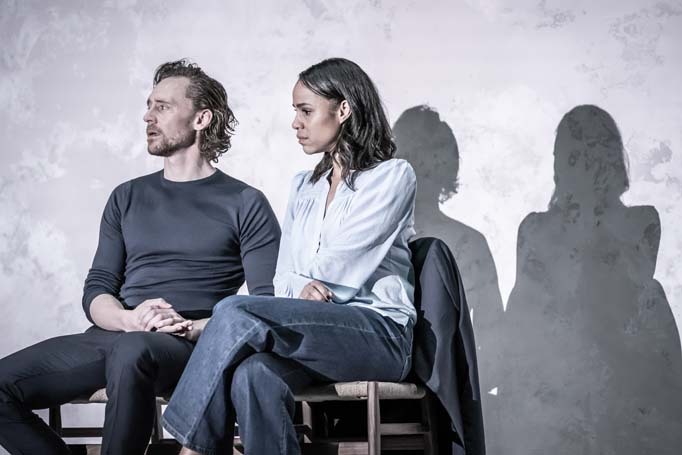 Tom Hiddleston and Zawe Ashton in Betrayal. Set design: Soutra Gilmour. Lighting: Jon Hopkins. Photo: Marc Brenner. It’s a play which feels like a still life, I think as I edge around the line of people crowding around the stage door, sharpies in hand. I step into the road and head up towards Leicester Square. There’s a young couple standing outside the pub opposite the theatre, fingers lightly interlaced. The man says something to the woman and a cloud crosses her face. Yes. Something like a still life. Beautiful, undoubtedly well crafted, but a little hard to love. A touch too arch – the shine on the apple Zawe Ashton eats a little too bright, the clink of the glasses Tom Hiddleston and Charlie Cox toast with just slightly too clear, mirroring those scarily arch, cut-glass vocals which bounce and echo. The clean lines of the revolve, and Soutra Gilmour’s pink-washed gallery walls just a little too high. There’s always just a little too much empty space onstage for it to feel comfortable. Rightly so. Not a cosy play, this. The distance comes with the territory. I can’t imagine how else you’d handle it. I hop over a puddle towards Charing Cross, working my way up to Tottenham Court Road, neon lights bouncing off the wet pavement. I read Betrayal while I was at school, when my interest in theatre was still small and delicate, just a tiny candle-flame of a thing. My English teacher, when I asked her for recommendations, suggested Beckett and Miller, Williams and Osborne, Pinter and Hare. I liked Pinter but I found him hard to get a handle on – the cleanness of the words, the scalpel edge in each pause – it kept pushing me away. I preferred Tennessee Williams – the lushness of the language, the violence palpable and simmering – the ideal playwright for a hormonal teenager. I don’t really remember what I thought of Betrayal. I think I was a bit dismissive. Old people having boring old problems. Boring. I think it’s the bit when Emma (Ashton) ends her seven-year affair with Jerry (Cox), bathed in Jon Clark’s cold wash of light. I lean down and scribble in my notebook – “lake frozen over”. Icy stillness at the surface, full life simmering underneath. Two moons lazily circling each other in the dark sky above. Straight white men talking to each other onstage is never interesting. Straight white men talking to each other onstage can sometimes be interesting – when the writer is interested in what men do and don’t say to each other – or can and can’t say. It is genuinely quite alarming how good Tom Hiddleston is. A smooth, charming domestic abuser (something which is swept over, possibly just there to provide a little bit of, yaknow, grit and shade to the character – ah, Pinter! ), a man whose charisma is so palpable that you miss the cold edge to his words until a few moments after the fact, a man whose brittleness has been papered over with silvery charm. Zawe Ashton is luminously good – there’s a winding wile to her presence onstage. There’s a metallic feel to their relationship. When she tells him about her affair it’s like there’s a rupture under the ground we stand on. Maybe not quite a rupture. Betrayal is never quite that open with us. More of a rumble. The feeling of tectonic plates shifting. They’re all onstage constantly, drifting through each other’s scenes like idle ghosts. I don’t feel like I’ve seen anything for ages where you can just feel that the director completely loves the text. Jamie Lloyd – he’s soaked into it. The purpose, and deliberation. You can imagine that every line was pored over, considered. There’s a weight to everything. Every pause. It’s meticulous. I love it. I love it when you can feel the muscle under the skin of the work. My ankle buckles underneath me and I stumble outside Warren Street tube station. I take a moment to rub the joint. It hurts. Not keenly. Just an ache. There’s a bit with a child onstage which reminds me of the bit in The Writer where it says something like “do we really need to have a baby onstage just so we can feel something?”. This play – this production, frosty as it is, does need it. It’s a glimpse of soft yellow light which could so easily be snuffed out by the persistent misty greyness onstage. Stakes are thrown into relief, the warm life that exists outside these three lonely planets is brought into this weird, chilly purgatory. Because that’s what it is. Or what it feels like. When the lights go down you can imagine them just existing there, on that smooth grey-pink stage forever, circling around each other, but never actually, quite touching. I walk deeper into the dark, rain stained London streets, ankle gently throbbing. Betrayal is on at Harold Pinter Theatre until 1st June. More info and tickets here.